I am a resident in NY who worked in NJ for less than 4 months and then came back to NY. 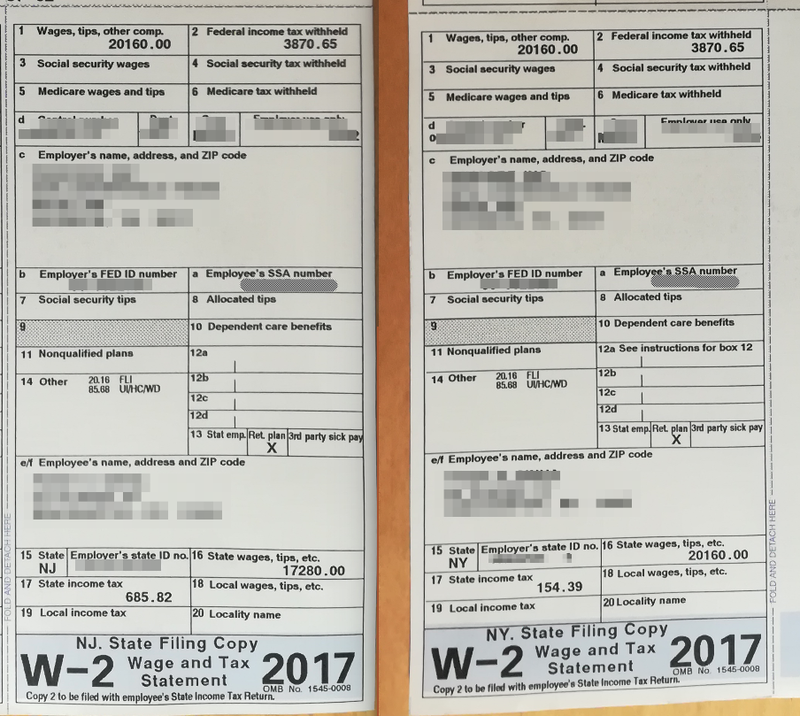 In my W2, my state wages (field 16 in W2) for NY and NJ state doesn't add up to the total Federal income. It is like $17280 more. While filing tax return, I learnt that the sum of total state wages should be equal to Federal income. My total income was 20160. Kindly let me know if I am wrong and there is no discrepancy in the W2. I have attached a picture Attached picture of state filing copy for NY and NJ state both. The best source for this information is your pay stubs. If you saved those, you can add up the New York and New Jersey ones. Failing that, ask your employer to clarify. The New York and federal wages are the same ($20,160; henceforth $20k). This suggests to me that your federal number is correct and reports your total wages for the year. Your New Jersey number reports your total wages earned while working in New Jersey. Your New York number reports total wages earned while residing in New York. The problem would seem to be that you earned $17,280 (henceforth $17k) while working in New Jersey but residing in New York. That overlaps on all reports (NY, NJ, federal). You also seem to have earned $2880 (henceforth $3k) while working in and residing in New York. That only shows in the federal and New York numbers. According to Intuit (link is for working in Pennsylvania while residing in New York but should apply to New Jersey as well), you have to pay taxes in New Jersey as a nonresident on the $17k. You have to pay taxes on the entire $20k in New York, but you should get a credit for the taxes you paid in New Jersey. I tried looking at the tax form instructions (PDF), but I do not see where you report that. Assuming Intuit is correct, then the W-2s are also correct. It's just that they are reporting slightly different information. The New Jersey form is reporting all income while working or residing in New Jersey. But you didn't reside in New Jersey, so that's just working in New Jersey. The New York form is reporting all income while working or residing in New York. $3k of that overlaps because you were both working and residing in New York. $17k of that is just for residing in New York (and is also reported to New Jersey). TL;DR: Those numbers don't have to add up and may be correct as listed. If so, file the New Jersey taxes first and then ask New York for a credit for the New Jersey taxes paid. Not the answer you're looking for? Browse other questions tagged united-states state-income-tax new-york new-jersey or ask your own question.